I do not want to be right in theory but in nature. I'll never grow to like the word "blog." At newciv.org, where perhaps blogging was invented, we've used the word "log" to describe the simple acts of composition that record the thoughts and events of our days. Blog is a heavy, slogging sort of word to me, and yields none of the poetic beauty I associate with the act of writing...especially on the Internet. I like the idea I'm keeping a log of my voyage. Even "diary," with its romantic, secretive connotations, is better than blog---a word that invites derision in its very pronunciation. Be that as it may, I came to the computer this morning with the innocent intention to catch up on email. (Continued apologies to the legion out there to whom I owe messages and replies.) The very first note I read was from Tim Chavez in Columbus, who's a friend of Annie Warmke, proprietress of the innovative www.bluerockstation.com. I'm sure Tim and I are going to get to meet someday soon, but for now we're still encouraging each other's politics with messages now and then. This one, which he actually sent yesterday, sent me browsing all over the place for an hour...and maybe you'd like to share. Hopefully you already know all about this, but I'm just learning. Her entries have been collected into TWO books now, easily available at Amazon. [link] There are 2 editorial reviews at that link, but you may also be interested in what The New York Review of Books has to say [link] , and maybe a very moving extract at Open Democracy [link] . The customer reviews at Amazon are indicative of the impact Riverbend is having around the world and here in the States especially. The actual blog is right here at Blogspot, where so many of us also store our writing: [link] . The other blogger may be considered an Iraqi exile I suppose. Raed Jarrar left his homeland in 2005 and moved here for the time being. Also at Blogspot, he began writing in 2002 at Dear Raed and his earliest entries still are there [link] . But since moving here he writes at Raed In The Middle [link] . Raed's current work, with a photo of him, is described here: "Since the summer of 2006, Mr. Jarrar has worked as the Iraq Project Director of Global Exchange where he facilitates the publication of op-eds and policy papers by Iraqi leaders in U.S. newspapers and works at bridging the gap between Iraqi leaders and U.S. Congress members by arranging face-to-face meetings between U.S. and Iraqi leaders. He is currently based in Washington DC. I have yet really to delve into these blogs but I look forward to do so. I have a feeling, between the two of these young people, we have a chance to learn some different truths about this world. Would anyone of us be surprised if we learned that our view of the Mideast, or, precisely, Baghdad, in all its forms, is actually quite unreal? With a kind of innocent arrogance we went into this war expecting, many of us, that the Iraqis would gladly great us as liberators, sharing the blessings of Western democracy and the free market with them. Now we're paying the price. Though ours is small compared to the sufferings ordinary Iraqis, who wish, undoubtedly, to live in peace and be left alone, must endure. Is there any answer or relief for them? Answer ... or relief for Iraquis? Iraq was created by Britain! Iraq does not exist other than as a fantasy created for profit by those who create, from nothing, the worlds currencies so they can engage in profit mongering machinations. The bid for control of this world, I don't mean control in its' positive vector either, is there on the drawing board for all to see. Yet few there be that have the eyes (the intelligence and knowledge) to see it happening right before their eyes. It is an old, old, story... Quinty san. Know who is behind it all? Weep not for that shattered world but rather what are you going to do to rebuild your own sanity after the show is over and you see the dupe for just what it is? I appreciate your concern. I think you are a good man as confused as a lot of others by the calculated deceptions that are being forced upon your mind body composite. The root is being cleansed and there are many actors, players, upon the stage. What is your part, Quinty san, in the over all over all? And do you somehow see yourself as seperate, not being involved, isolated, not able to do anything about the apparent injustices that Karma is revealing to be something other than what they appear to be? Read the Major Prophets of the TeNaCh and you'll see just how this has all come about. Three major religions at one anothyers throats since the ginning of the Be. Be, Do, Have ... and NOT Have, Do, Be. America has that a bit backwards. Have first, then do, then be... Universe doesn't operate that way so... who is behind that? Vax, but no thanks. And please tuck your complacency back onto the shelf. It's old and stale stuff. Complacency? Where in the above do you see complacency? I could say that I see the same thing in your reaction? Heh, but I won't. So a refusal to go to your own heart and mediate can mean only one thing. You're the tin man! 25 Feb 2007 @ 11:29 by jazzolog : Is There Civil War In America? The role of the neocons in our government since they invaded and occupied the White House is seldom if ever mentioned by the main stream media. My information sources are limited and it is difficult to assess their credibility but the argument can be made that but for the neocons, we would not be in danger of permanently losing our democracy with its rights and obligations, duties and privileges. The United States is in the middle of a de facto civil war. The combatants are the neocons and their allies, the industrial/military complex, the main stream media, and the fundamentalists on one side and those who are defending our Constitution and the rule of law in general, foreign and domestic, the true patriots, on the other. The United States cannot be both a militaristic empire and a democracy such as was built on the principles set forth in our Constitution. Only one side can win. The treatment of "disobedience" is very much a part of a fascist form of control...and that possibility is at the very center of Joe Conason's new book It Can Happen Here. A large excerpt from the beginning of the book is posted at AlterNet, with a lot of comments. The excerpt ends, "The question that we face in the era of terror alerts, religious fundamentalism, and endless warfare is whether we are still the brave nation preserved and rebuilt by the generation of Sinclair Lewis -- or whether our courage, and our luck, have finally run out." http://www.alternet.org/rights/48246/ Which side are you on? since I see no similarity between these comments and my back and forth with Vax. Less you feel as if you're falling into a rabbit hole go to the bottom of http://www.newciv.org/nl/newslog.php/_v350/__show_article/_a000350-000025.htm#comments for my response to Vax. As for "it happening here" there was a lot of talk of that among leftwing circles before the 2006 November elections. Perhaps due to the victory of the Democrats the sense of urgency fell off. After all, with their rise to power in the Congress, there would finally be some accountability: investigations and committee hearings - Bush's complete power appeared nipped at the bud. But I agree with Conason. We have a right to worry. Not much has been made of the camps Bush has prepared here at home, in the United States. For what? Civil unrest? How many of them are there and how large are they? And in foreign affairs, yes, military might seems to be the only tool of foreign policy he knows. As well as intimidation, even of our allies. We know this not only by observing Bush but from the Neocons, who believe the United States has a rightful obligation to rule the world. What are they planning? How far do they intend to go? Many of us speculated before the elections (not much has been said since then) that another terrorist attack, a disaster, and Bush would declare martial law and suspend the Constitution. What with Bush's behavior so far it's not so crazy to think so, or, at the very least, wonder and worry. Will the American people rally around the president in a time of crisis? Or has he lost so much credibility by now that sense and sanity will prevail? And what about the military? They tend to be pretty gung ho, true believers. Will they follow their Commander in Chief to restore order? Are there enough generals in the military who love the taste of authoritarianism to fall into lockstep behind the president? And why chose this president? Because he's the clown who is outlandish enough to go all the way? Is RA El just asked the USA if it could go ahead and bomb, preliminaries) Iran. Our Carrier groups are over there now to set up another scenario making it impossible not to bomb that country too and the dollar slides thanks to Japan. Got a Yen for anything these days? Unfortunately the mind, yours/mine, works in such a way that whatever you focus your attention upon (worry about) will tend to come to pass. Washnigton D.C. was NEVER EVER my Capitol. I never signed the joke called a Constitution, this bull has been going on since Andrew Jacksons' time and I don't believe a word of what any of the Pundits are saying. Prescott Bush and the Wallstreet Gang brought Hitler and Communism to power that they might quibble over what was left over after the fight which was none other than the prelude to what you see happening, not before your eyes, in the bought and paid for Psyops game calle "THE MEDIA!" for misrepresenting your views. I thought I would draw a contrast between a congressional approach of something like impeachment and the to-the-barricades cry of those too fed up to wait around. At any rate when the secret room at AT&T feeds me to the Feds, I'll be the one hauled off to Guantanamo to create a new "rendition" of jazzoLOG. Thanks for the heads-up at Mad Mad World. glad to see someone else thinks so too, my use usually stumbles as it sounds like swearing, whereas Logging on or in sounds more socially acceptable, suggests worthwhile activity taking place, you should be here sort of thing. Anyway Phew!! on that one. I do read all the rest here, but usually remind myself that we are not supposed to try and rule the whole world but just our own small lives, and those immediatly around us. We are responsible at the end of the day for ourselves, and our loved ones if they are still maturing like children or adoptees, but no one else, they are for themselves. Friends is as far it can go with others and good wishes. Sometimes we try to make it more than friends but it is self duping, so friends is good. Maybe Vax is in a position to do something at his level, I don't know, and maybe Quinty his in the Peace Line, but whatever it is it won't show up in any discussion they have, it will only show in the ether to spiritual beings who see all. If Jazzolog does not mind them batting it out on his log, then it is fine. Please carryon with your Fine Persian carpets of literature Richard, they do good too! 27 Feb 2007 @ 19:38 by vaxen : Hey Hey! I'm not the batter. I just throw the ball. We Scienos are a weird group, I know, but... I, a Pan Deterministic PLAYER, follow no ones orders and create my own universes. The end of theirs, the Oppressives who think they ''run'' this world according to ''command'' know nothing, absolutely nothing, about real "COMMAND and CONTROL." If I punctured that thin armor of yours in any way, Quinty san, then please dig deep down in that stony old heart of yours and release yourself! Kidding! But jazzolog knows me... I'm one of the good guys! Oh, where have I heard that one before? I jest, of course... Nukes don't. Love you all, bar none. 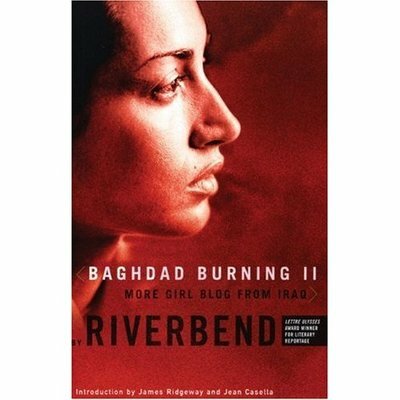 Thanks to Terry Liu over at MySpace for referring me to Riverbend's latest entry, which says the family is giving up and leaving Baghdad...and Iraq. How horribly sad! "So we've been busy. Busy trying to decide what part of our lives to leave behind. Which memories are dispensable? We, like many Iraqis, are not the classic refugees- the ones with only the clothes on their backs and no choice. We are choosing to leave because the other option is simply a continuation of what has been one long nightmare- stay and wait and try to survive. "On the one hand, I know that leaving the country and starting a new life somewhere else- as yet unknown- is such a huge thing that it should dwarf every trivial concern. The funny thing is that it’s the trivial that seems to occupy our lives. We discuss whether to take photo albums or leave them behind. Can I bring along a stuffed animal I've had since the age of four? Is there room for E.'s guitar? What clothes do we take? Summer clothes? The winter clothes too? What about my books? What about the CDs, the baby pictures? "The problem is that we don't even know if we'll ever see this stuff again. We don't know if whatever we leave, including the house, will be available when and if we come back. There are moments when the injustice of having to leave your country, simply because an imbecile got it into his head to invade it, is overwhelming. It is unfair that in order to survive and live normally, we have to leave our home and what remains of family and friends… And to what? "It's difficult to decide which is more frightening- car bombs and militias, or having to leave everything you know and love, to some unspecified place for a future where nothing is certain." May her family leave safely. Let's hope wherever she goes that she continues to journal. 6 Mar 2008 @ 09:17 by jazzolog @4.253.112.106 : Riverbend: Where Is She? One month after the post above, she wrote about crossing the Syrian border back into Iraq for a visit. There's been no word from her in the 5 months since.